Living in big cities have its hazards. 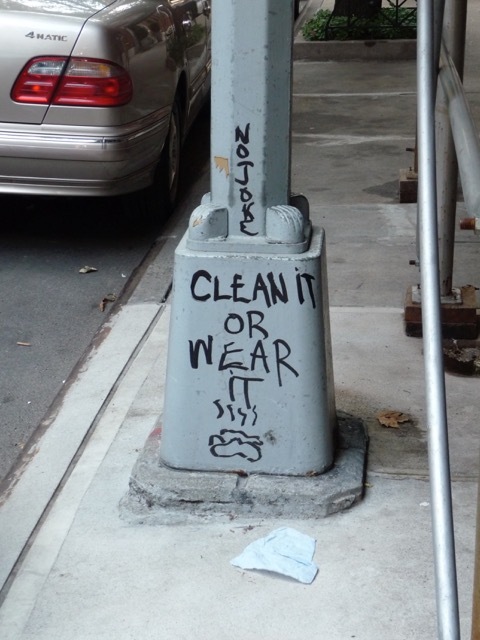 One person stepped on one urban “land mine” too many and left this furious note to inconsiderate dog owners. It’s the same reason I always look down when I walk on city streets. Looking down has its rewards. I see many interesting things. 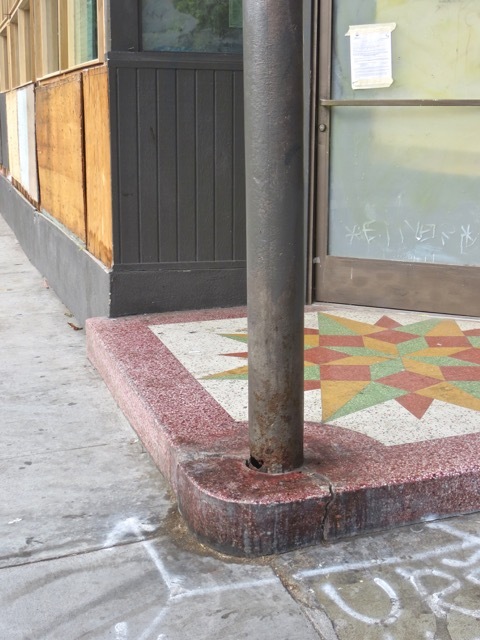 This steel column of a house in San Francisco had been urinated on by dogs for decades and is corroded through. It is structurally unsafe, caused the closing of this storefront and instigated an extensive renovation of the house. 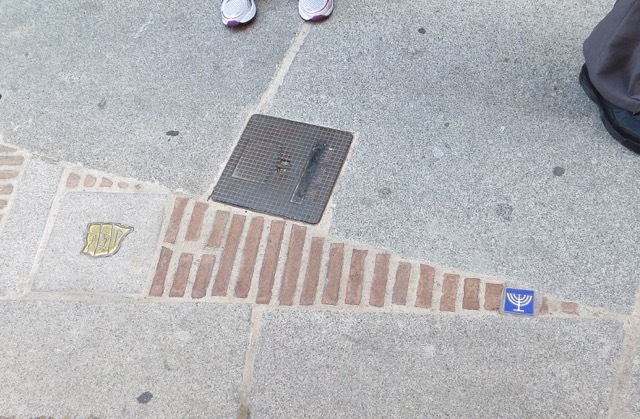 The little tile embedded into this sidewalk in the old town of Toledo, Spain, indicates the area as a (former) Jewish ghetto. On a path in WuYi Mountain (武夷山) in FuJian (福建), China, I stopped at a rest area. Non-smoking zone is demarcated from smoking-allowed zone by a few etched lines. I didn’t think smoke could read and would stay confined in the green zone. 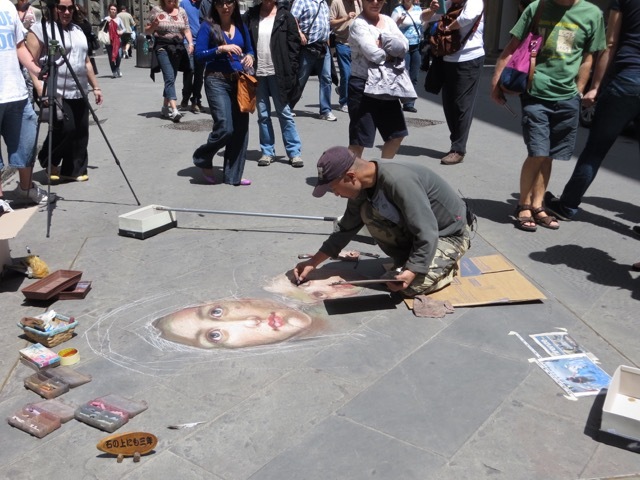 This artist drew beautiful pastel murals on a sidewalk in Florence. 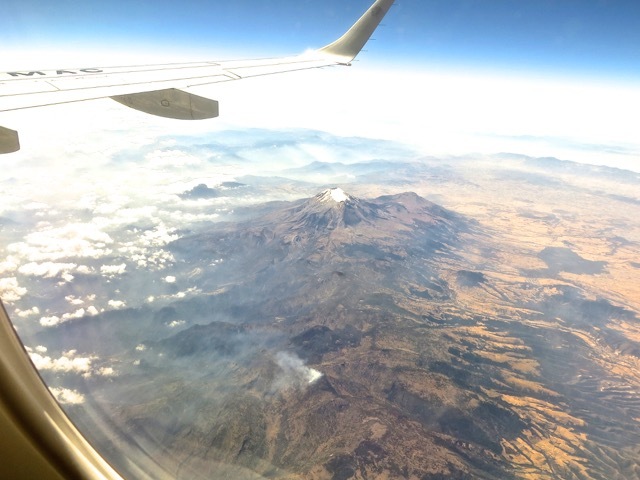 Looking down from a plane over Mexico, I saw a smoking volcano. 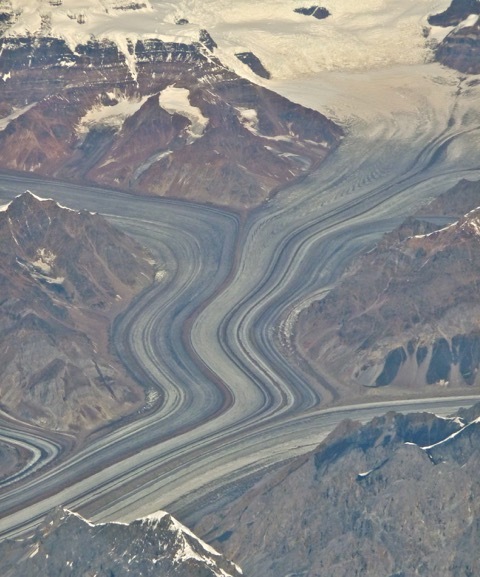 On our way to Alaska, I saw these converging glaciers with well defined flows. 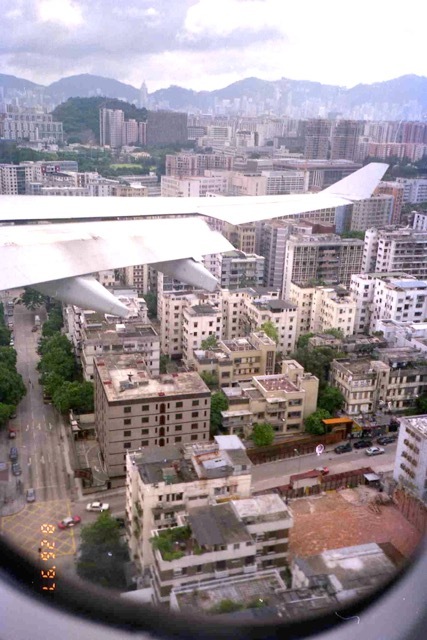 But no plane ride gave me as much excitement as the landing at now-demolished Kai Tak Airport (啟德機場) in Hong Kong. 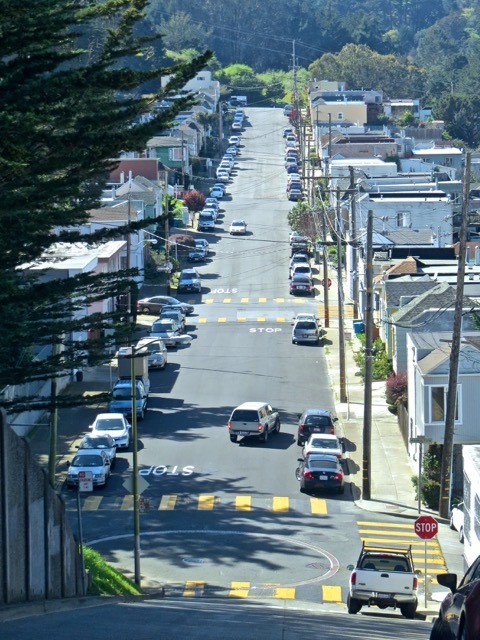 The plane would swoop in over tenements, bank sharply to the right with its wingtip almost brushing against laundry on rooftops, and landed on a runway that jutted out to sea. 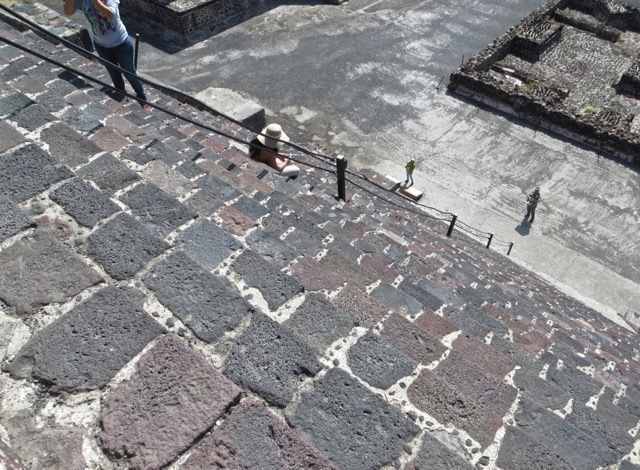 Looking down from the Pyramid of the Moon in Teotihuacan, Mexico, the stairway was very steep. The cable railing helped with the climb. 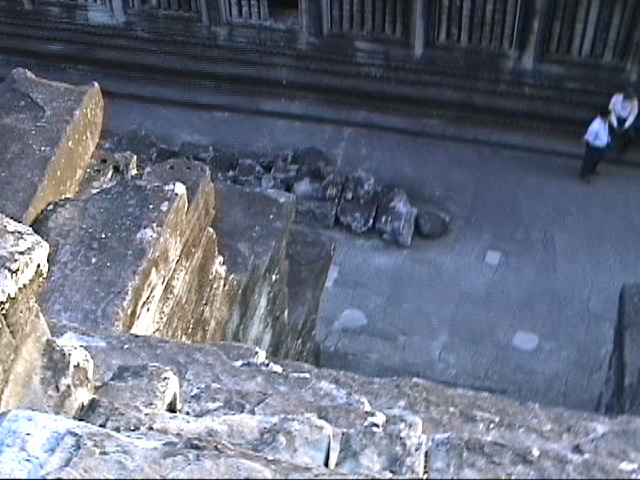 The stairway in Angkor Wat in Cambodia was even steeper, and it did not have cable railing. Completing the climb gave Sally and me a great sense of accomplishment. 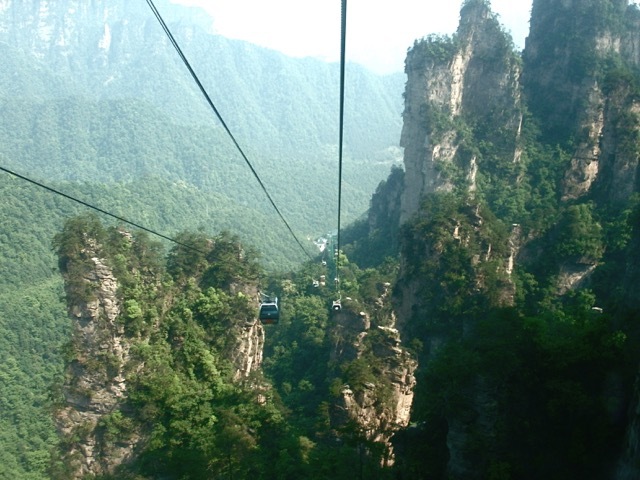 Looking down from a cable car as it threaded through tall, slender quartz sandstone columns in ZhangJiaJie (張家界) in Hunan (湖南), China, was quite an experience. I felt like one of the flying creatures in the movie Avatar which took inspiration from this fantastic landscape. 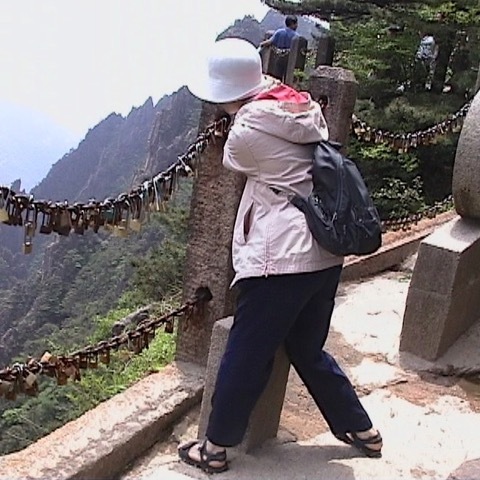 Sally got weak knees looking down a high cliff in HuangShan (黃山) in AnHui (安徽), China. 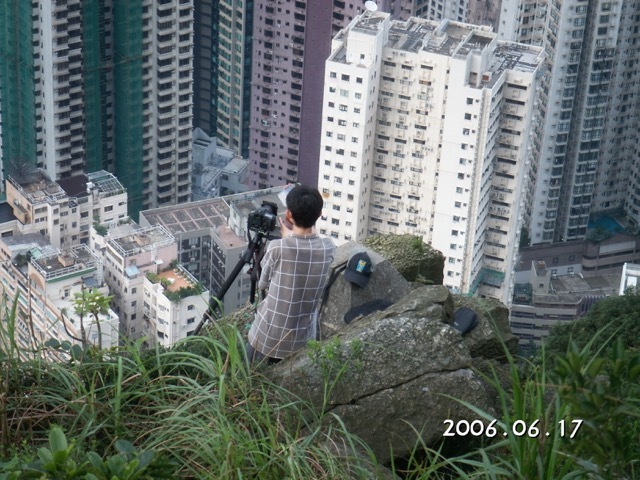 This photographer looked relaxed while perching on a cliff over the densely packed apartment blocks of Hong Kong. From my office in Hong Kong, I looked down at the tall building across the street. The bamboo scaffolding were built by agile daredevils from the roof downward. Bamboo poles were hoisted into place by hand, and tied into the matrix with nylon bindings. San Francisco was destroyed by fire after the massive earthquake in 1906. 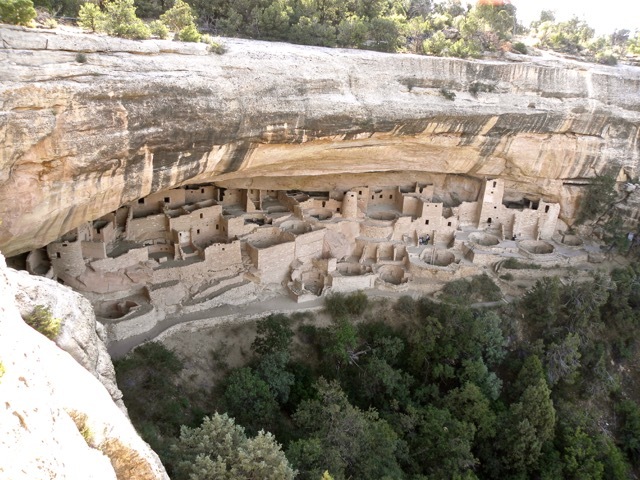 Subsequently, the city built 177 cisterns to store water for fire fighting purposes. 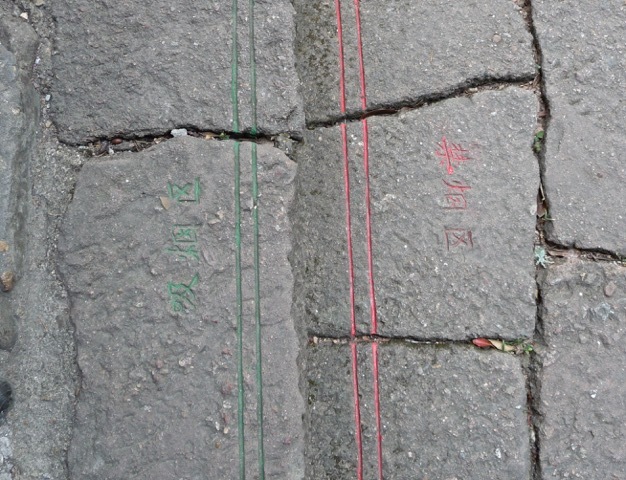 Sea water is distributed to these cisterns, marked by big circles on pavements. 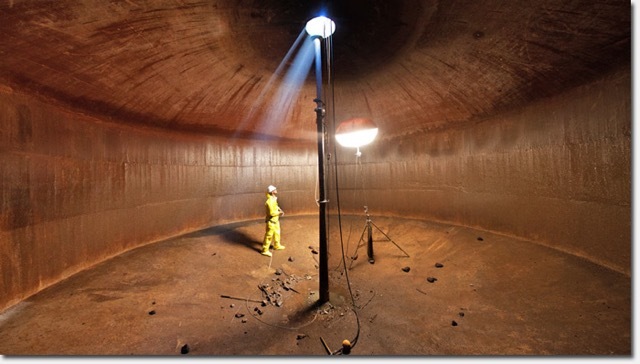 These cisterns are massive, holding up to 200,000 gallons of water. 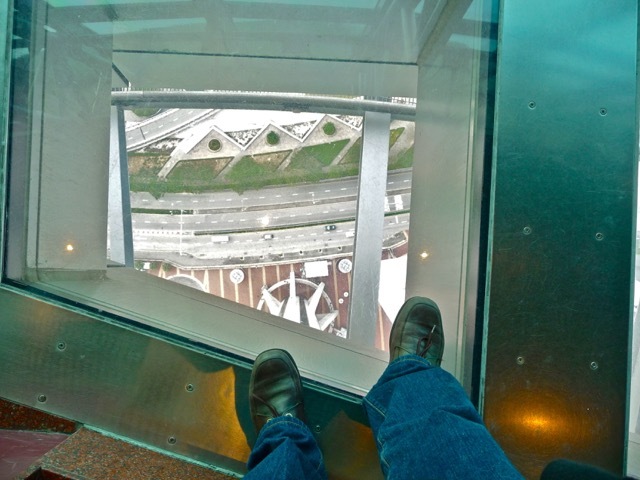 I looked down from the Macau Tower (澳門觀光塔). At 1,100 feet tall, it is one of the tallest in the world. 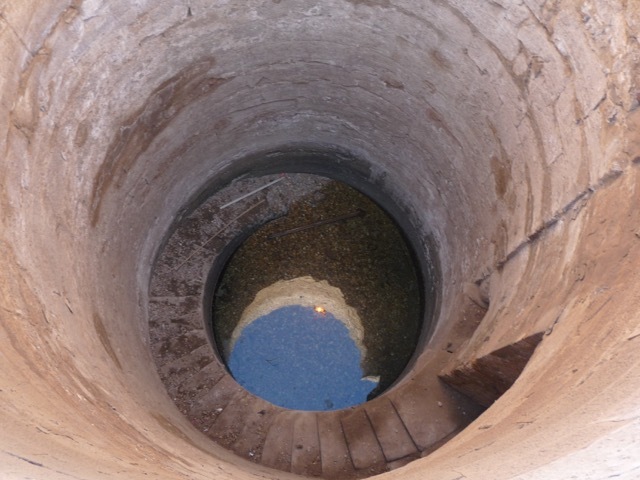 This well in Egypt was used by ancient Egyptians to measure the flooding of the Nile to forecast the crop harvest. 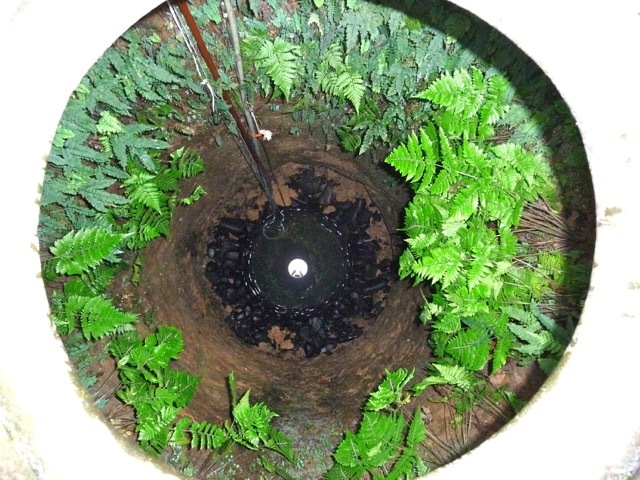 This well in FuJian (福建) supplied drinking water to a village. Nowadays, water is drawn with electric pump instead of a bucket tied to a rope. 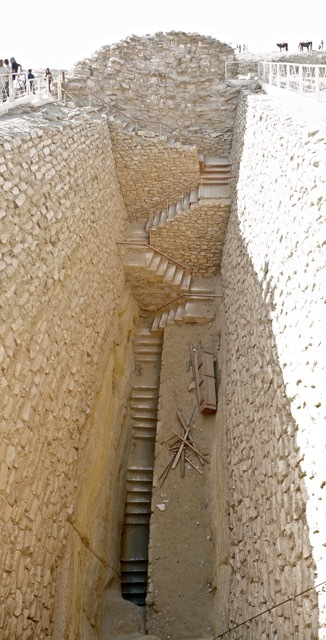 Near the Stepped Pyramid in Egypt, I saw this deep pit built by ancient Egyptians. How they dug this steep and broad-faced pit and kept it from caving in was an engineering marvel to me. Hawaii islands are built by lava flows. 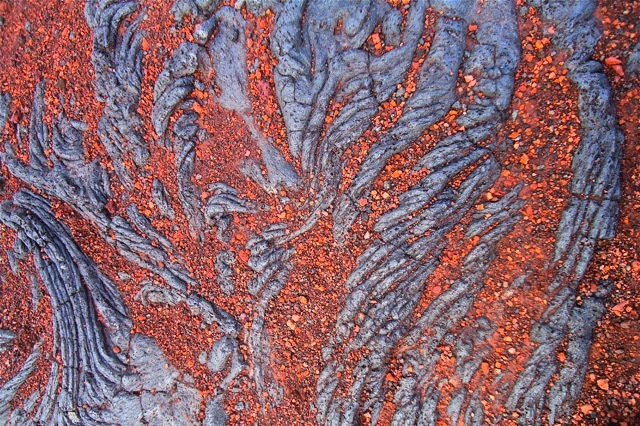 These solidified lava and red gravel formed an interesting pattern. 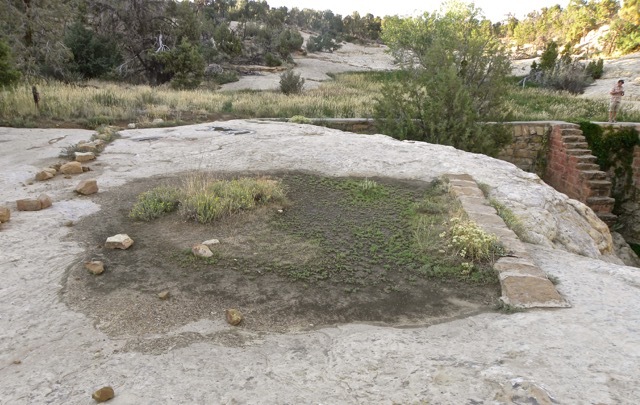 While visiting ancient Indian cliff dwellings in Mesa Verde, USA, we saw this tiny dam holding back rain water and forming a tiny swamp. This tiny wetland was a tiny ecological eden to tiny creatures. Looking down from above, the Cliff Palace was an impressive relic. 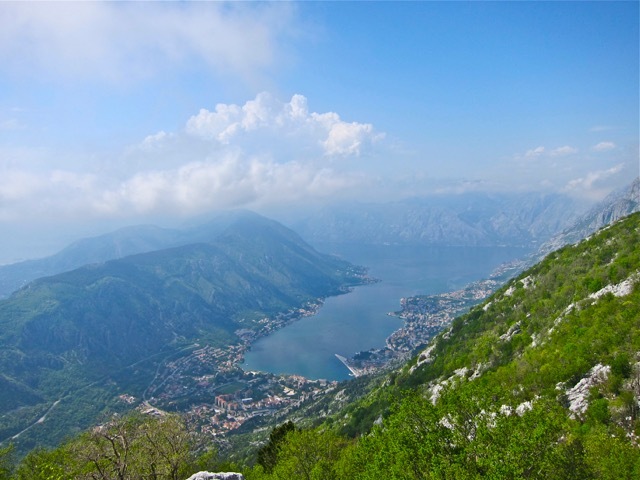 When we visited Montenegro, our bus left the medieval fortified town of Kotor and drove up the nearly vertical mountainside. Looking down after climbing a few thousand feet, the scenery was breathtaking. 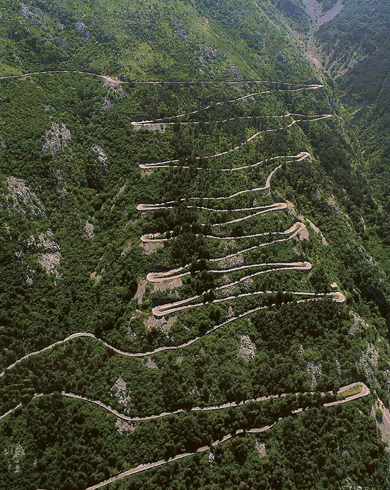 This aerial view of some of the 26 hairpin turns of the road shows how precarious it is. Many people rate it as one of the most dangerous roads in the world. I am glad I did not drive but had an experienced bus driver at the wheel. 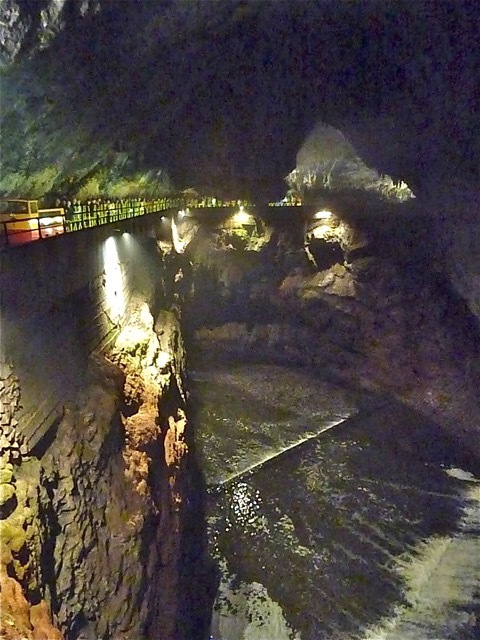 In Slovenia, we visited Postojnan Cave. A big underground river runs through it, and a train carries tourists deep into the cave. 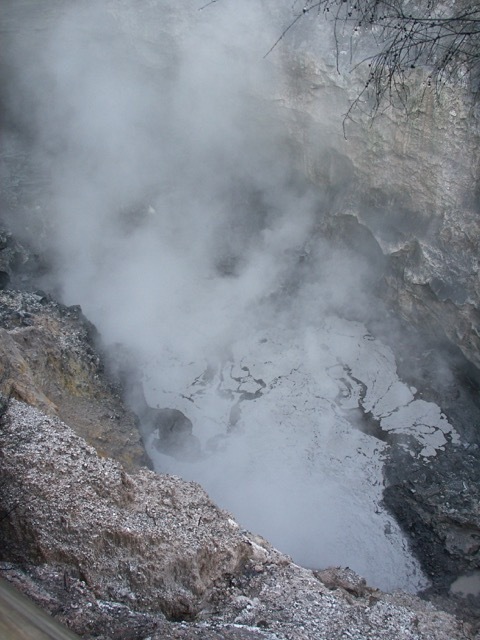 Looking down through sulfur steam into a big gurgling thermal mud pool in Rotorua, New Zealand. 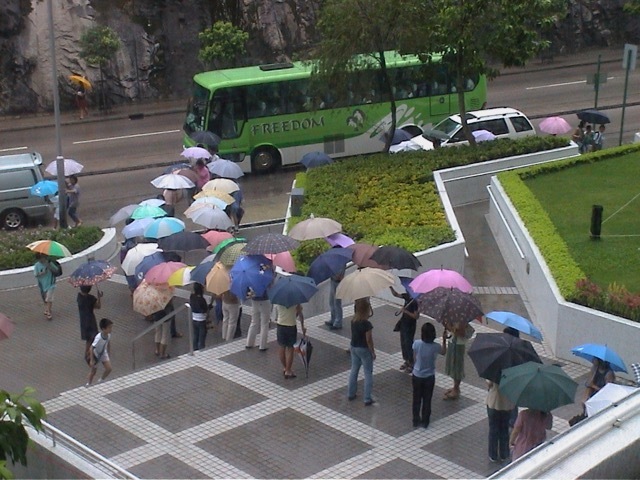 Looking down from my flat in Hong Kong, I saw Japanese mothers forming an umbrella corridor to shield each other’s kids from the rain. 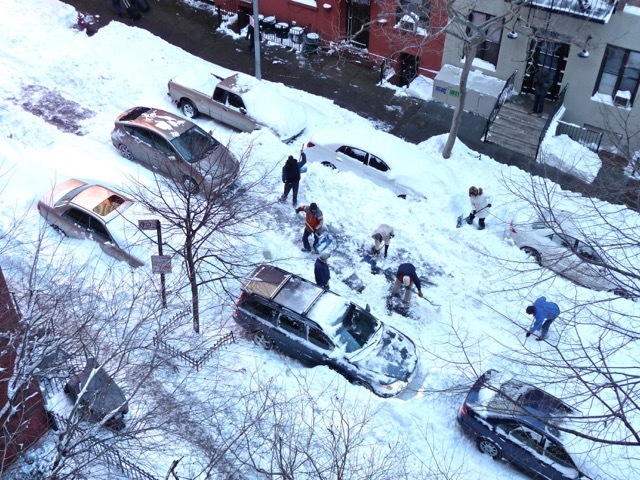 New Yorkers chip in after a heavy snow storm to help one another. I find many heart warming scenes when I look down. 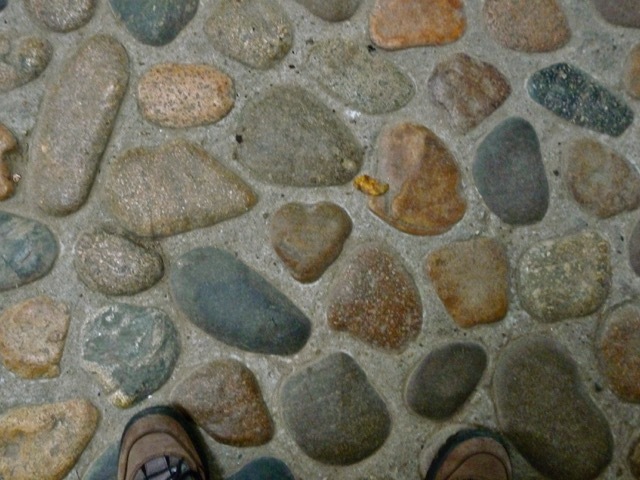 On a stone-paved path in China, I found a heart shaped stone embedded in concrete. Lucky me. Posted by Robert Wu on Wednesday, March 18, 2015, at 12:55 am. Filed under Uncategorized. Follow any responses to this post with its comments RSS feed. You can post a comment or trackback from your blog.